In Vermont we get a ton of great musicians from all over the world and sometimes they even visit the sessions. This weekend the band Craobh Rua will be performing at Billings at the University of Vermont, on Sunday, April 10 at 3pm. 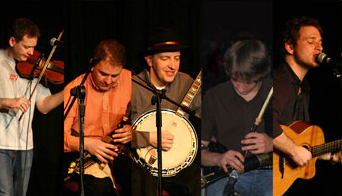 They play a mix of “rousing jigs, reels and polkas with tender ballads and airs featuring Uilleann pipes, fiddle, whistles, tenor banjo, mandolin and guitar.” For tickets contact Mark Sustic at mrksustc@together.net. You might want to bring your instrument as rumor has it they might also show up at the session at Ri Ra the Irish Pub on Sunday from 5-8pm.